It has become increasingly clear that the United States government has deliberately delayed issuing a visa to Hamid Abutalebi, Iran's new Permanent Representative to the United Nations in New York City. Abutalebi, a career diplomat who has previously served as Iran's ambassador to the European Union, Australia, Belgium, and Italy, was appointed to succeed outgoing ambassador Mohammad Khazaee by Iranian President Hasssan Rouhani late last year, following the landmark nuclear agreement signed between six world powers and Iran in Geneva on November 24. Abutalebi has been unable to assume his diplomatic post for months due to the U.S. State Department's decision to hold up approval of his visa application. This past week, Bloomberg News finally provided the reason behind the American power play: Abutalebi was allegedly a member of the Muslim Students Following the Imam's Line, the organization of revolutionary students that took control of the U.S. embassy on November 4, 1979 and held 52 Americans hostage for 444 days. "The Americans are very strict about this and they conduct thorough investigations to make sure those who get visas did not participate in the U.S. embassy takeover," explained Mohsen Sazegara, one of the founders of Iran's Islamic Revolutionary Guard Corps (IRGC) and currently a U.S.-based political analyst who has previously served as a visiting fellow at the AIPAC-affiliated Washington Institute for Near East Policy. Sazegara spoke with the International Campaign for Human Rights in Iran, which also noted that, in 1980 "Aboutalebi, along with Abbas Abdi, a student instrumental in the US Embassy takeover, traveled to Algeria to invite representatives from several 'liberation movements' to attend a meeting in Tehran. The invited groups included the Palestine Liberation Organization (Fatah), the Polisario Front, the Moro Islamic Liberation Front, the Front for the Liberation of Zimbabwe, members of Shi'a communities from Saudi Arabia and Iraq, and Lebanon's Amal Movement." Ebrahim Asgharzadeh, one of the leaders of the 1979 embassy takeover and subsequent occupation, told Iranian journalist Omid Memarian this week that Abutalebi had no direct or organizational role in the seizure or hostage-taking. Abutalebi, who had studied at the Sorbonne, was asked to act as a translator for the students "because of his fluency in English," Asgharzadeh said. "He wasn't one of the main students involved in the event, with an ongoing responsibility. After the siege, we defined new responsibilities such as 'document translation' or 'communicating with foreign reporters,' and this is why we used some people on a temporary basis." In an interview with Iran's Khabar Online News website in mid-March, Abutalebi addressed rumors of his role in the hostage crisis. "For the past 15 years, I have been an ambassador to many Western countries that are very close to the U.S., from Europe to Australia, and have always been dealing with the West," Abutalebi said. "Even in 1994, when I traveled to the US as a member of our country's delegation at the UN General Assembly for a while, no questions [about my involvement] ever came up." He continued: "On November 4  and at the time of the occupation, I was not in Tehran... When I heard of the incident, I was in [the southwestern Iranian city of] Ahvaz." Abutalebi was later told that the students occupying the embassy "needed somebody to do French translation for them. I accepted... On few other occasions, when they needed to translate something in relation with their contacts with other countries, I translated their material into English or French. For example, I did the translation during a press conference when the female and black staffers of the embassy were released and it was purely based on humanitarian motivations." Abutalebi made clear his belief that the hostage crisis has severely damaged U.S.-Iran relations. The takeover, "challenged American power in international arenas," he said," and "caused subsequent fears of each other and each country's developments to run deep between the American and Iranian people and officials. The phobia, by and by, became so profound that any measure taken by one side – either positive or negative – stirred intense fears both inside and outside of the United States and in Iran." Wholly supportive of the initiatives of the Iranian president, Abutalebi stated that Rouhani had already "managed to put an end to three major problems facing Iran's foreign policy," which he defined as Iranophobia, Islamophobia, and the "alleged and imposed political and economic isolation of Iran." This, he said, "has been his greatest victory." 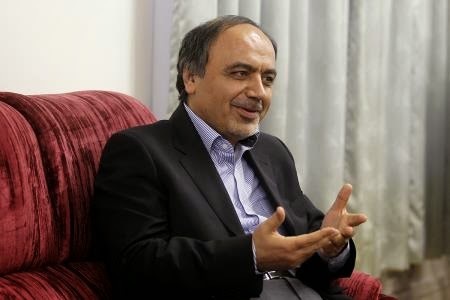 Noting that, after so many years of animosity and suspicion, "relations between Iran and the United States are not a current focus of attention for the executive authorities in Iran, or even in the United States," Abutalebi still maintained that "we must do our best to solve the multitude of problems that have been created so far" between the two nations. "After solving these problems and through ever-increasing mutual understanding and trust, we would be able to come back and focus on the issue of relations," he said. Reuters reporter Louis Charbonneau has noted that Abutalebi is "widely seen as a moderate and reformist," who has close ties to Rouhani and former presidents Akbar Hashemi Rafsanjani and Mohammad Khatami. "Hamid has never been a hardliner," an unnamed Iranian Foreign Ministry official and friend of Abutalebi told Reuters. Another acquaintance, the well-known reformist journalist Mashallah Shamsolvaezin, called Abutalebi both "progressive" and "pragmatic." The reaction from American officials - former and current - over his appointment and visa application has been nothing short of hysterical. The consensus view seems to be that the Iranian ambassador to the UN serves no other function than agitating against the United States, even though Iran is a sovereign nation, UN Member State, current chair of the Non-Aligned Movement, and enjoys robust relations with nearly every single nation on the planet. "We think this nomination would be extremely troubling,"said State Department spokeswoman Marie Harf at a press briefing Wednesday. "We're taking a close look at the case now, and we've raised our serious concerns about this possible nomination with the government of Iran." "There'll not be any rapprochement with Iran until hostages are compensated for their torture," declared Tom Lankford, a lawyer representing the former American hostages since 2000. "It's important that no state sponsor of terror can avoid paying for acts of terror." Lankford called the appointment "yet another slap in the face" of those held hostage and insisted that the U.S. government "should not permit this to happen." Former hostage Barry Rosen said the same thing, calling it "a disgrace" for the government to consider granting Abutalebi entry to the United States. "He can never set foot on American soil," Rosen said. Despite not knowing Abutalebi's precise role in the embassy seizure, Rosen opined to the New York Post, "He's just as guilty as anyone of torture," adding, "It would be a travesty of justice. It would be like spitting on us." Meanwhile, former Bush appointee to the UN, John Bolton, who championed the invasion of Iraq and has urged the American or Israel bombing of Iran for years now, told Fox News, "This is a thumb in the eye of the United States... Personally I think Iran should either be expelled or suspended under the UN charter because it is not a peace loving state. I have no hesitation at all in saying we should deny a visa to this individual." Texas Senator Ted Cruz introduced legislation this week that his office said was meant "to prevent known terrorists from obtaining visas to enter the United States as ambassadors to the United Nations," according to the New York Times. The appointment of Abutalebi was "deliberately insulting and contemptuous," he said. "Hamid Aboutalebi was a major conspirator in the Iranian hostage crisis and has no business serving as Iran's ambassador to the UN," New York Senator Chuck Schumer told the New York Post, without providing evidence to back up his charge. "This man has no place in the diplomatic process, and the State Department should flat-out deny his visa application," he added, seemingly unaware that Abutalebi has for years held senior diplomatic posts around the world. Overblown outrage aside, the United States has no legal standing to deny Abutalebi a visa. The United States hosts the United Nations and is obligated to allow diplomats to do their jobs. It is not up to the State Department to pick and choose which diplomats are admitted, unless they pose an immediate national security threat, which obviously Abutalebi does not. Bluster, pandering, and hurt feelings surely do not permit the United States to withhold a visa. "Good heavens," Michael Doyle, a former UN official and now an expert in international and public affairs at Columbia University told the Christian Science Monitor. "It's like discovering someone was in the SDS in the 1960's." Yet, the United States has a long history of playing pouty politics when it comes to issuing diplomatic visas - a "petty game," in the words of UN expert Jeffrey Laurenti, that underscores the petulance of the world's only superpower. In 2007, Barbara Masekela, South Africa's ambassador to the United States from 2002 to 2006, was denied a visa to visit her dying cousin and did not receive a waiver until after her cousin had passed away. Indeed, until July 2008, South African leader Nelson Mandela and other members of the African National Congress (ANC) were included on the U.S. State Department's terrorism watch list and thereby officially denied entry to the country. Earlier that year, then-Secretary of State Condoleezza Rice told a Senate committee that it was "a rather embarrassing matter" for her to have to issue specific waivers to South African diplomats traveling to the United States. Iran's UN delegation has also previously been at the receiving end of this charade. "For years, the way the United States issues diplomatic visas has irked U.N. lawyers and annoyed foreign governments, including Cuba, Iran, Russia and Venezuela, who complain that the U.S. routinely scuttles the plans of their leaders or allies to visit the U.N. for important meetings," Colum Lynch wrote in Foreign Policy in 2011. "The accusations have embarrassed diplomats at the U.S. mission in New York: In one cable from July 2009, they protested that U.S. 'credibility is damaged when a visa is denied so long after the fact.'" The United Nations host-country agreement signed by the United States is not a suggestion that can be ignored on a case-by-case basis, depending on how the winds of D.C. lobbying and alliances blow. It's not up to ignorant blowhards in Congress, hungry for campaign funding and phony tough-guy credentials, to determine who foreign nations can appoint as their international representatives. The law of UN treaty obligations - three of them, in fact - is clear, as Dapo Akande, a professor of public international law at Oxford University and founding editor of EJIL: Talk!, the blog of the European Journal of International Law, has previously pointed out. Article 105 (2) of the United Nations Charter, signed in 1945, states, "Representatives of the Members of the United Nations and officials of the Organization shall similarly enjoy such privileges and immunities as are necessary for the independent exercise of their functions in connexion with the Organization." Being present at the United Nations headquarters in New York is obviously required for representatives to fulfill their diplomatic duties. The 1946 General Convention on the Privileges and Immunities of the UN [Art. IV, Section 11(d)] maintains that "Representatives of Members to the principal and subsidiary organs of the United Nations," along with their spouses, are exempt from "immigration restrictions, aliens registration or national service obligations" in foreign states in which they work, travel, or visit. Refusing a visa to a UN representative is therefore a violation of this General Convention. The federal, state or local authorities of the United States shall not impose any impediments to transit to or from the headquarters district of (1) representatives of Members... or families of such representatives...; (5) other persons invited to the headquarters district by the United Nations... on official business. The provisions of Section 11 shall be applicable irrespective of the relations existing between the Governments of the persons referred to in that section and the Government of the United States. Finally, Section 13 (a) states that "[w]hen visas are required for persons" fulfilling diplomatic duties for Member States, "they shall be granted without charge and as promptly as possible." In reporting on this issue, Reuters noted that, while the United States "is required to allow U.N. diplomats to come to New York under its host country agreement with the United Nations," it still "reserve[s] the right to refuse visas to those seeking to work as diplomats in New York." While seemingly a contradictory notion, the pertinent distinction may lie in Abutalebi's role as a permanent - and therefore, resident - member of Iran's diplomatic corps in the United States. Article V of the Headquarters Agreement may provide this loophole: "...resident members of [UN Member State] staffs... may be agreed upon between the Secretary-General, the Government of the United States and the Government of the Member concerned." However, the staff of Iran's Permanent Mission to the UN is different from the "person designated by a Member as the principal resident representative to the United Nations of such Member or as a resident representative with the rank of ambassador or minister plenipotentiary," as noted in the Agreement. This individual (or individuals) is not subject to joint approval or agreement by the UN or the United States for entry and residence in New York. As Hamid Abutalebi has been appointed as Iran's ambassador, and not merely a staff member, he is exempt from this protocol or scrutiny. "It may not have been the wisest choice for Iran to make given Rouhani's efforts to make nice," Columbia University's Michael Doyle says, "but it's their choice." For the United States to deny Abutalebi his visa would not only be shameful, it would be illegal. April 5, 2014 - Robert Mackey of the New York Times' The Lede blog has posted an excellent and comprehensive run-down of the Abutalebi firestorm. In addition to a number of fascinating and frustrating tidbits, he also points out that the MEK is at the forefront of opposing Abutalebi's ambassadorship - which is effectively proof that this is all one big propaganda campaign promoted by factions intent on sabotaging any Iranian rapprochement with the West. While it is not clear where the accusations against Mr. Aboutalebi began, one group fiercely opposed to any diplomatic resolution to the standoff between Iran and the West, the Paris-based exiles who call themselves the National Council of Resistance of Iran, have actively promoted the idea that Mr. Aboutalebi was a leader of the hostage-takers. The same exile group — whose militant wing, the Mujahedeen e-Khalq, or People’s Mujahedeen, was removed from the State Department’s list of foreign terrorist organizations only in 2012 after a well-financed Washington lobbying campaign — upped the ante further on Thursday, claiming that Mr. Aboutalebi had “coordinated” the assassination of one of its members in Rome in 1993. One has to love the delicious irony of a member of a group which took diplomats hostage invoking diplomatic protocol.